There are two ways of uninstalling Airmail and setting it up again. These are described below. To accomplish this method, please move the app to trash from the applications folder as shown in the video below. and login back to the App Store to avoid such situation. Using this method, you will not loose any of the preferences from Airmail. 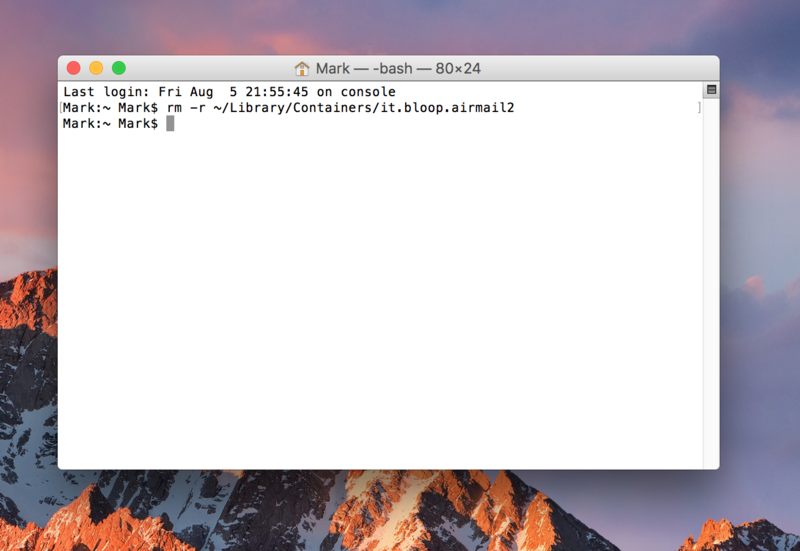 ~/Library/Group Containers/2E337YPCZY.airmail and then move this folder to the desktop. and then launch the app to get a fresh copy. For macOS Sierra and older - Fresh Install. setting up accounts, it is advisable to save your account settings and preferences to iCloud. Move the Airmail app to trash from Applications as shown in the video above. Open Terminal: (⌘+Space Bar then type Terminal) and copy paste the following command and hit enter. Then re-install Airmail from App Store and open to proceed further.